American crocodile Crocodylus acutus, photographed by Tomascastelazo. The family Crocodylidae includes the crocodiles Crocodylus and their closest fossil relatives. The false gharial Tomistoma schlegelii may also be a member of this group, though its phylogenetic position has been open to debate. Members of this family have relatively narrow, elongate heads. 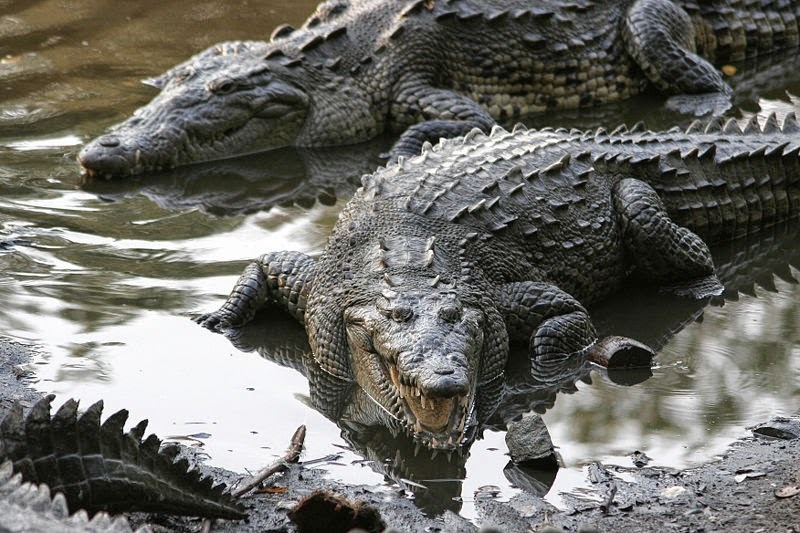 The largest living species, the saltwater crocodile Crocodylus porosus, may reach lengths of well over six metres. Other species may be considerably smaller; the Australian freshwater crocodile C. johnstoni, for instance, is usually less than two metres in length. [B81] Brooks, D. R. 1981. Hennig's parasitological method: a proposed solution. Systematic Zoology 30 (3): 229–249. [LA04] Llinás Agrasar, E. 2004. Crocodile remains from the Burdigalian (lower Miocene) of Gebel Zelten (Libya). Geodiversitas 26 (2): 309–321. [MA04] Modesto, S. P., & J. S. Anderson. 2004. The phylogenetic definition of Reptilia. Systematic Biology 53 (5): 815–821. [PS01] Pickford, M., & B. Senut. 2001. The geological and faunal context of Late Miocene hominid remains from Lukeino, Kenya. Comptes Rendus de L’Academie des Sciences—Series IIA—Earth and Planetary Sciences 332: 145–152. [SF03] Salisbury, S. W., E. Frey, D. M. Martill & M. C. Buchy. 2003. A new crocodilian from the Lower Cretaceous Crato Formatioin of north-eastern Brazil. Palaeontographica Abteilung A: Paläozoologie—Stratigraphie 270: 3–47. [SL01] Sereno, P. C., H. C. E. Larsson, C. A. Sidor & B. Gado. 2001. The giant crocodyliform Sarcosuchus from the Cretaceous of Africa. Science 294: 1516–1519. [SWS14] Somaweera, R., D. Woods & T. Sonneman. 2014. A note on the Australian freshwater crocodiles inhabiting Tunnel Creek cave, West Kimberley. Records of the Western Australian Museum 29 (1): 82–87. Last updated: 6 April 2017.